Son of William Henry and Alice Maude Mary Irving, of Edward St., Glandore, South Australia. Native of Adelaide. Only son of Ernest Felix and Alice Elizabeth Jentsch, of "Carlton," Hampstead Rd., Petersham, New South Wales. 20th July 1916, aged 24. Son of Ronald and Elizabeth Johnston. Native of Inverell, New South Wales. A 23 year old school teacher prior to enlisting on 1 October 1915, Pte Johnston left Australia for Egypt with the 13th Reinforcements of the 2nd Battalion from Sydney on 20 December 1915 aboard HMAT Aeneas. Transferring to the 54th Battalion as part of the 'doubling-up' of the AIF in April 1916, Pte Johnston was in France for less than a month before taking part in the attack on German positions at Fromelles on the night of 19/20th July 1916. According to his Red Cross Missing and Wounded File, Pte Johnston was last seen wounded in front of the German trenches and was not recovered when the attack withdrew. Initially listed as missing, Pte Johnston was later confirmed by German sources to have been killed in action. Whilst his paybook and identity discs were later found in the Royal Prussian War Office in Berlin, the location of his grave was unknown and he was originally commemorated on the VC Corner Australian Cemetery Memorial prior to the discovery of his remains in 2008. Son of Thomas Harding Kendall and Bridget Mary Kendall, of "Kirmington," Abergeldie St., Dulwich Hill, New South Wales. ​20th July 1916, aged 22. Son of Adolf Michael Knable and Alice Knable of Wellington Mill, Dardanup, Western Australia. Born at Melbourne, Victoria. A 21 year old school teacher prior to enlisting on 3 August 1915, he embarked with the 1st Reinforcements from Adelaide aboard HMAT Geelong on 18 November 1915. He was killed in action on 20 July 1916 in the Battle of Fromelles in France. ​32nd Bn. Australian Infantry, A. I. F.
Son of Johanna Lawlor, of 122, Gray St., Adelaide, and the late John Patrick Lawlor. 19th July 1916, aged 40. Son of David and Lettia Livingston; husband of Lillie M. Livingston, of 3, Esplanade, Elwood, Victoria. Native of Tarraville. A 38 year old grazier prior to enlisting on 5 November 1914, he embarked with the D Company from Melbourne aboard HMAT Ascanius on 10 November 1915. He was killed in action on 20 July 1916 in the Battle of Fromelles in France. 20th July 1916, aged 25. Son of James McGregor McKenzie and Mary McKenzie. Native of Talia, South Australia. A 24 year old farmer prior to enlisting on 2 May 1915, he embarked for overseas with the 2nd Reinforcements of the 27th Battalion from Adelaide on 23 June 1915 aboard HMAT Kanowna. After fourteen weeks on the Gallipoli peninsula he was evacuated back to Egypt and took ill. On recovery he was transferred to the 32nd Battalion and sailed for France. Pte McKenzie was killed in action on 20 July 1916 at Fromelles, France. Son of James and Kennethina McKenzie, of "Strathmore," Orroroo, South Australia. Native of Morchard. Son of Jean Gustav Momplhait and of Edith Helen Bushell (formerly Momplhait). Born Alberton, South Australia. A 28 year old clerk prior to enlisting on 17 June 1915, he embarked for overseas with the 11th Reinforcements of the 10th Battalion from Adelaide on 27 October 1915 aboard HMAT Benalla. Pte Momplhait was killed in action on 19 July 1916 at Fromelles, France. Between 19th and 20th July 1916, aged 25. ​Son of George and Jennett Pagan, of "Burnside," Scott Grove, East Malvern, Victoria. Native of Ardmona. A 24 year old farmer prior to enlistment on 9 July 1915, he embarked for overseas with the 2nd Battalion from Sydney aboard HMAT Argyllshire (A8) on 30 September 1915. In February 1916 he transferred to the 54th Battalion where he was promoted to Lance Corporal on 1 May of that year. He was killed in action on 19/20th July 1916, at the Battle of Fromelles, France. 20th July 1916, aged 38. Son of William James and Mary Parham; husband of Ethel May Parham, of "Edgarville," Rose St., Prospect West, South Australia. Native of Port Pirie. Pte Parry successully enlisted on 15 July 1915 having been previously rejected for "insufficient chest measurement". He embarked with A Company of the 29th Battalion on board HMAT Ascanius (A11) on 10 November 1915. On the 19th of July 1916 he was severely wounded during the battle of Fromelles (Fleurbaix). Meeting up with his older brother Reuben (1211 Pte Reuben Parry of the same battalion), close to the German lines the two decided that Frederick should try to return to the Allied lines while Reuben and the remains of his unit carried on. Reuben was captured shortly after and Frederick was never seen again. Later that year his family learned via the Red Cross that the Germans had recovered his body and had given him a Christian burial. His brother Reuben survived the war and provided the information about his brother's last hours to the Red Cross. A month after his two boys went missing their father 14827 Sergeant (Sgt) George John Parry enlisted, age 53. Sgt Parry, a railway employee from Brunswick, Vic, enlisted on 21 August 1916 and was posted to the Army Medical Corps (AMC) Sea Transport Staff. He was discharged on 10 January 1917 but immediately re-enlisted for home service duty at McLeod Camp, Vic, where he served as a Sergeant until 1920. Son of Theodor and Mary Jane Pflaum, of Birdwood, South Australia. 19th July 1916, aged 25. Son of George and Euphemia Beatrice Pollard; husband of Hilda G. Pollard, of 305, Raglan St., Ballarat, Victoria. Native of Northcote. c 1915. 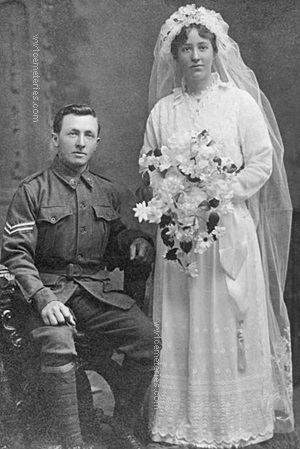 Wedding portrait of 324 Private (Pte) Herbert George Pollard, 29th Battalion from Betley near Dunnolly, Victoria and his wife Hilda. A 24 year old farmer prior to enlistment on 7 July 1915, he embarked for overseas with A Company from Melbourne on 10 November 1915 aboard HMAT Ascanius. He was killed in action at Fromelles, France on 19 July 1916. Although the image shows Pte Pollard wearing Corporal stripes, his service records contain no details of a promotion to that rank.